Donald Trump was a boon to the Democratic Socialists of America, or DSA. The organization, founded in the early 1970s, had comfortably maintained between 5,000 and 10,000 members for most of its existence. But on the first day following Trump’s victory in the 2016 election, over 1,000 individuals joined DSA. Between November 2016 and July 2017, DSA gained over 13,000 new members. 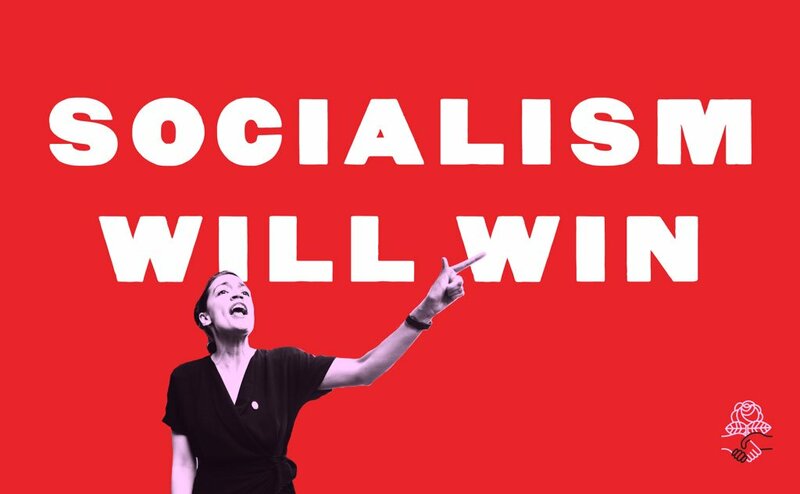 As of now, there are over 30,000 Democratic Socialists of America, and, after a shocking upset in last Tuesday’s New York congressional primaries, one appears headed to the United States House of Representatives. Alexandria Ocasio-Cortez’s victory over Rep. Joe Crowley — the “King of Queens,” ten-term incumbent, chair of the House Democratic Caucus and shortlisted successor of Minority Leader Nancy Pelosi — stunned the political world, and it all but guarantees that the 28-year-old member of DSA’s New York City chapter, NYC-DSA, will head to Washington, D.C., in January. Ocasio-Cortez’s win is another big boost to DSA, especially its New York City branch, and DSA helped her pull off the event that sent shockwaves throughout local and national politics. NYC-DSA co-chair Abdullah Younus told Gotham Gazette that the local chapter canvassed for Ocasio-Cortez and provided her with political guidance. In an interview with Gotham Gazette, Younus described the Democratic Socialists of America as a “grassroots, member-driven organization.” It is not a political party, but an activist organization with an array of chapters in 47 states and Washington, D.C., united under the rule of the 16-person National Political Committee, which guides and helps implement DSA’s political goals. It endorsed Ocasio-Cortez in late April. She had been running for the Democratic nomination to represent District 14, covering parts of Queens and the Bronx, in the U.S. House of Representatives since the previous May, and approached NYC-DSA for its endorsement. Ocasio-Cortez’s platform largely aligns with DSA’s leftist values. She centered her campaign on racial, social, and economic justice, with a heavy focus on housing affordability, and has called for universal health care coverage, a federal jobs guarantee, and the abolition and investigation of Immigration and Customs Enforcement (ICE). She regularly provides variations of her belief that “in a modern, moral, and wealthy society, no person in America should be too poor to live," as she said on The Late Show with Stephen Colbert, and has said, “to me, what socialism means is to guarantee everyone a basic level of dignity,” according to NYC-DSA. NYC-DSA runs a citywide Electoral Working Group that recruits and supports socialists running for local election, operating what Younus termed a “candidate recruiting pipeline.” The Electoral Working Group contacts individuals interested in running for public office and discusses with them the prospects of a political run, focusing efforts on women, people of color, and working-class New Yorkers. Once she’d received the approval of the Electoral Working Group, different organizational branches, and, ultimately, the citywide group, Ocasio-Cortez gained access to NYC-DSA’s veritable army of canvassers. 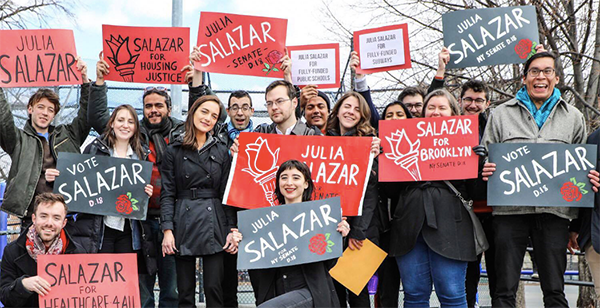 NYC-DSA members knocked on “thousands of doors” throughout District 14 in support of Ocasio-Cortez, collected voter data, and assisted with funding, according to Younus. Ocasio-Cortez was buoyed by small-dollar donations and used the comparison to Crowley’s heavily-corporate-funded campaign to make her case as someone in tune with the community who would not be influenced by large donors. NYC-DSA has offered its endorsement sparingly. The only other candidate in New York City currently endorsed by the organization is Julia Salazar, an organizer running for New York State Senate in Northern Brooklyn’s District 18, where she is attempting to unseat state Senator Martin Dilan in the Democratic primary set for September 13. Nationwide, DSA is emerging as a significant political force. Dozens of DSA members are running for elected office, according to The New York Times, and “socialism” is hardly the dirty word it once was, especially among young Americans. DSA appears to be part of the energy moving the Democratic Party, and many of its elected officials, leftward, while also working to replace some of them. On the other hand, the presidential campaign of Senator Bernie Sanders, who was endorsed by DSA, and, now, the victory by Ocasio-Cortez have heightened public criticism by many on the right of “socialism,” where it is typically conflated with communist, authoritarian regimes, like Cuba’s, as opposed to modern European models, like in Sweden, that are guided by socialist principles. Those critics have also raised questions about Ocasio-Cortez's and other Democratic Socialists' views on raising taxes and allowing more immigrants into the country, among other issues. The New York City chapter of DSA is “absolutely” expecting to see an uptick in interest from prospective candidates seeking its endorsement and resources, said Younus, and the infrastructure to handle an influx in electoral work is said to be in place.